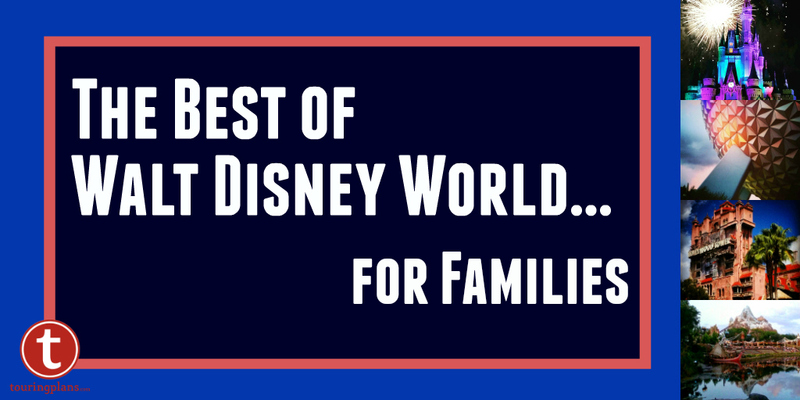 Of the many ways to participate in the shows and attractions at Disney World, one of the easiest is getting a joke included in the Monsters, Inc. Laugh Floor attraction at the Magic Kingdom. Here’s how to make it happen. Start your text with the word (rotating key word). Include your first name and hometown so we can thank you! While these instructions seem pretty simple, lots of folks fumble them. A common mistake is forgetting to include the show-specific key word. Without the key word, they don’t know that you’re actually at the theater and they won’t include your joke. Follow instructions and you’re ahead of the game already. 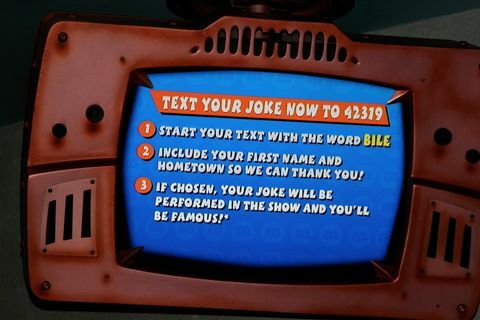 While sending a text is simple enough, the other critical part of getting your joke included in the show is sending in a good joke. In my unscientific study of a dozen shows, I’ve noticed a pattern in the jokes that were selected for inclusion. Jokes used during the show are typically short (they have to fit in a text, duh), use G-rated language, have a teeeeeny gross-out factor, or include a pun or Disney character reference. Bonus points if there’s a teeny gross-out, a pun, and a Disney reference! Q: How do you make a tissue dance? A: You put a little boogie in it! Q: Why did Tigger go into the bathroom? A: He was looking for Pooh. Q: Why did the cookie go to the doctor? A: Because it was feeling crummy. Q: Why does Peter Pan fly? A: Because he can never, never land. 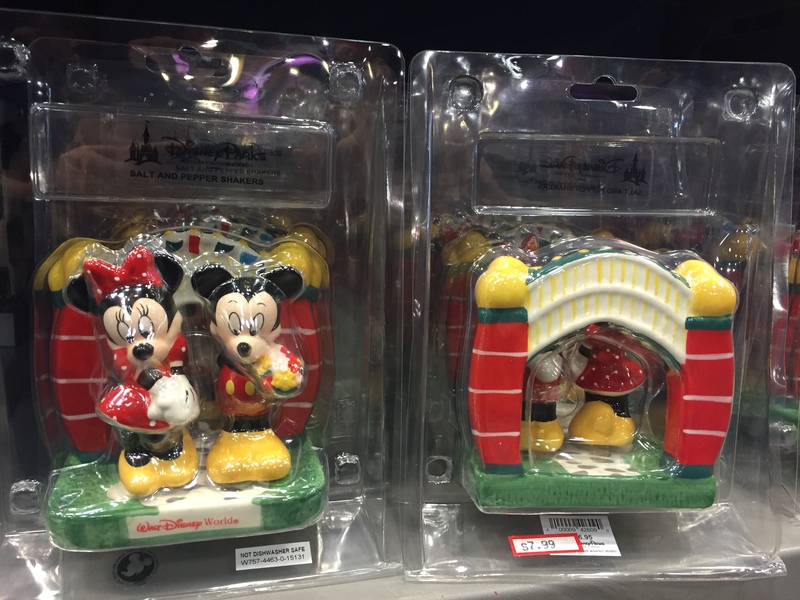 Q: What did Mickey say when he was falling? A: Donald, duck. 1: Knock, knock. 2: Who’s there? 1: Doris. 2: Doris, who? 1: Doris locked, let me in. 1: Knock, knock. 2: Who’s there? 1. Arch. 2: Arch, who? 1. Bless you. Q: Why was the tomato blushing? A: Because it saw the salad dressing. Q: Which side of a chicken has more feathers? A: The outside. Q: What did one math book say to the other math book? A: I’ve got problems. Q: Why do birds fly South in the winter? A: Because it’s too far to walk. Q: Why did Mickey fly into space? A: To find Pluto. Q: What’s the difference between a fish and a piano? A: You can tune a piano, but you can’t tuna fish. You get the idea – basically, if a third grader would think your joke is a hoot, then it’s likely that you’re in. Q: did the dolphin do a backflip by accident? A: no, he did it on porpoise! The number you text to does not vary from show to show. It is constant. It’s 42319. Get it? “For twenty-three nineteen”? 23-19 was the code for a human contamination in Monsters Inc. What changes is the keyword you need to start the joke off with. That’s how they determine what show you’re going to be in. Q: What’s a pirate’s favorite subject? My joke chosen was – what did the zero say to the eight? Nice belt. Again the childish 3rd grade math gets the laugh. The jokes are the best part and you laugh every time. We live in a town that the name is hard to pronounce. Would we be better off using a town nearby that has an easier name? Do you think it would make a difference on our joke being told? Knock, Knock – (Who’s there?) Dwain… (Dwain Who?) Dwain the bathtub I’m drowning! 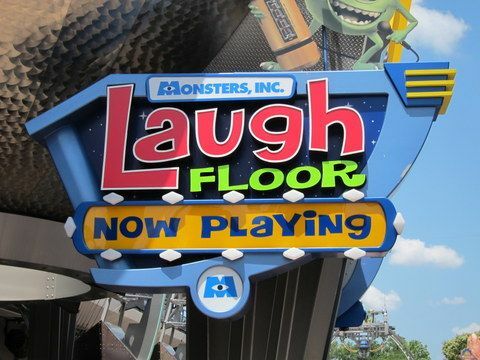 Monster’s Inc Laugh Floor is always fun! Why did the chicken cross they playground? Because it was too tired.